Visit cats and those who tend them at PAWS Animal Shelter during Saturday’s open house. 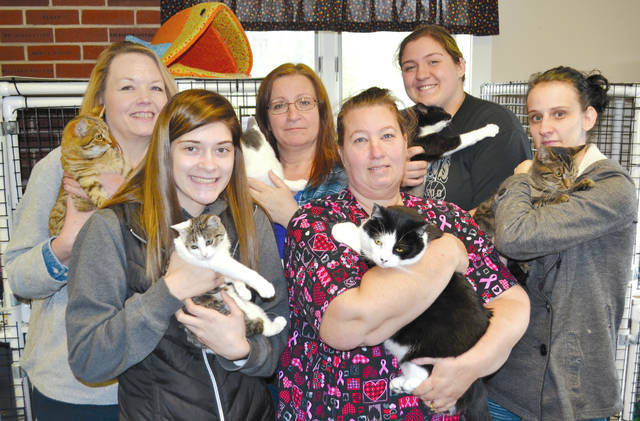 Shown are, back from left, board member Teresa Combs, Shelter Manager Alice Stanford, staff member Madi Vanscoy, volunteer Tiffany Keeler, front from left, Graham High School senior volunteer Myah Isaac and staff member Angie Elsass. PAWS Animal Shelter, located just west of Urbana at 1535 W. U.S. Route 36, is hosting an open house 1-3 p.m. Saturday. Visitors can purchase $5 raffle tickets, or five for $20, for a chance to win a basket with items such as a quilt, purse, autumn decor and cat picture frame. Each visitor donating at least $5 can write his/her name or a pet’s name on a paper mitten in the Help Keep the Kittens’ Mittens Warm This Winter fundraiser. Shelter Manager Alice Stanford said that the cost of propane is one of the shelter’s biggest expenses and invited donors to contribute to the shelter’s account with Heritage Cooperative. The shelter will host Photos with Santa noon to 3 p.m. on Dec. 1. Children and/or pets can pose with Santa Claus in exchange for a minimum $5 donation. There will also be a raffle and cookies. Stanford said a goal is to do a fundraising event every month. The shelter is open Tuesday through Friday from noon to 5 p.m. and on Saturday from noon to 4 p.m. For more information, call 937-653-6233.